Monday May 27th 1895 Will churned for me the first thing after breakfast and we put the washing in before noon. I ironed in the afternoon and put my hens out with the chickens. Will was down town in the afternoon and brought me some more barrels. weather still cool. 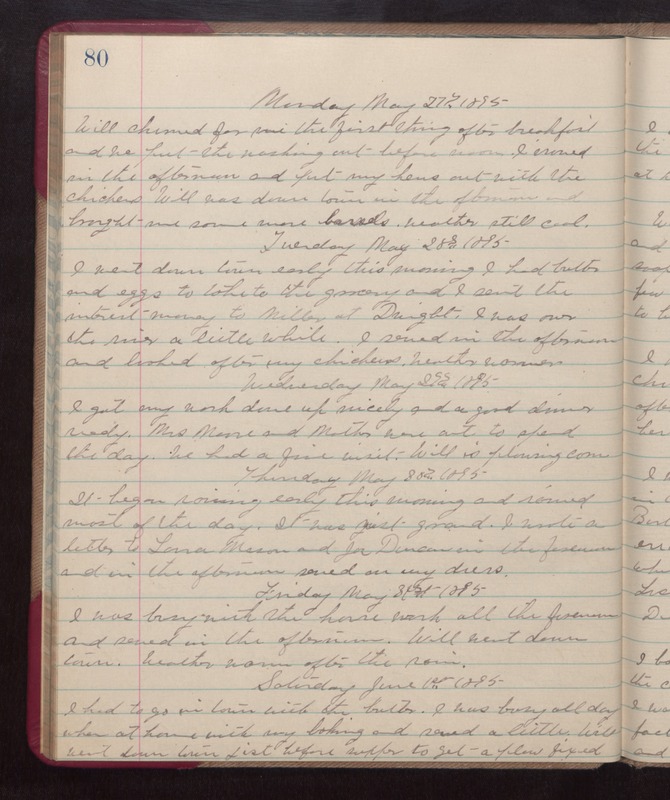 Tuesday May 28th 1895 I went down town early this morning. I had butter and eggs to take to the grocery and I sent the interest money to Miller at Dwight. I was over the river a little while. I sewed in the afternoon and looked after my chickens. weather warmer. Wednesday May 29th 1895 I got my work done up nicely and a good dinner ready. Mrs Moore and Mother were out to spend the day. We had a fine visit. Will is plowing corn. Thursday May 30th 1895 It began raining early this morning and rained most of the day. It was just grand. I wrote a letter to Laura Mason and Joe Duncan in the forenoon and in the afternoon sewed on my dress. Friday May 31st 1895 I was busy with the house work all the forenoon and sewed in the afternoon. Will went down town. weather warm after the rain. Saturday June 1st 1895 I had to go in town with the butter. I was busy all day when at home with my baking and sewed a little. Will went down town jist before supper to get a plow fixed.